These Keto Low Carb Lasagna Bowls are so delicious and such an amazing Italian Lasagna dinner treat. As you probably already know, the keto diet is a diet that has low amounts of carbohydrates, high fats, and moderate protein, it is possible to achieve your weight loss goals safely. These delicious Italian bowls of comfort food fit right into the Keto diet making this a win win meal. One of the most common ways that I fall off the wagon when I am on a diet is by giving in to my comfort food cravings. These Keto Low Carb Lasagna Bowls are one of my all time favorite comfort food treat meals. Add the marinara to the skillet once sausage is cooked. In a small bowl, mix parmesan into ricotta. Place 4 ramekins onto a baking sheet. Spoon a thin layer of meat sauce into each ramekins. Spoon ½ cup of ricotta into each ramekin. Top with a half cup of the meat sauce. Place under broiler until heated through, about 10 minutes. 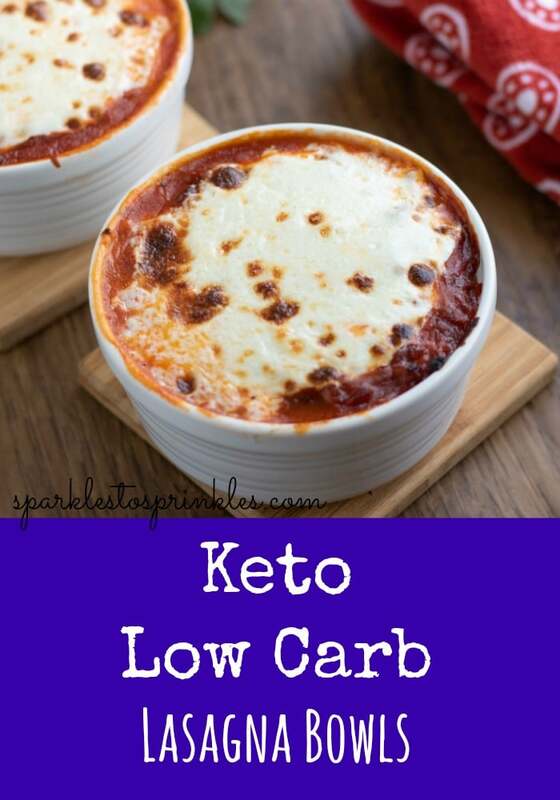 We make a lasagna soup that my family loves but I’m trying do more low carb. This looks delish!